The long, flowing strokes of this treatment work with the soft tissues of the body to enhance health and healing. Swedish massage is also known as the classic style of massage that uses touch, joint movement, and stretching for the purpose of relaxation, rehabilitation and health maintenance. Prenatal massage focuses on the unique needs of the mother to be. Some of the many benefits of prenatal massage include relaxation by relieving stress on joints, eases back, foot and neck pain, helps to maintain good posture, provides flexibility to birthing muscles, reduces fatigue, and helps to relieve nervous tension throughout the body. Massage can also help to reduce the discomfort from carpal tunnel syndrome and sciatica caused by pregnancy. At Wildflower Massage you are able to have your massage on your side or stomach using a pregnancy table. This table allows you to be on your stomach by using the recesses cut from the table to provide space for the growing uterus and breasts. Postnatal massage is also available to help ease the tension and provide relaxation after childbirth. Please call for information on massage for women during bed rest and labor! Prenatal massage packages also available. As a way to promote bonding between you and your baby, infant massage is an essential tool for any new parent. Massage also ease colic, improve sleep patters and stimulate brain development in your baby. Instruction is available in a group or private setting. Classes include demonstration and practice of an infant massage routine. This routine can be used as your child grows older and teaches them the benefit gained from a nurturing touch. Please call for pricing and class information. Deep Tissue massage is a slow, deep treatment focusing on areas of pain and/or dysfunction. The purpose of this massage is to release restrictions and alleviate chronic aches and pains within muscles. By melting through muscle layers the body is able relax and lengthen muscles and release holding patterns. Neuromuscular Therapy, or trigger point work, can be used in combination with deep tissue. Neuromuscular Therapy uses pressure to break up “trigger points” that may be causing referral pain. The deep tissue massage usually focuses on two or three areas of the body for the duration of the massage. Deep tissue can also be used in conjunction with Swedish massage. This body treatment uses hot and cold jade stone to promote relaxation, cleanse and flush tissue, and to bring balance and energy to the body. The stones ranging in temperature from 40 degrees F to 120 degrees F challenge the body’s systems. This challenge allows the body an opportunity to heal itself by releasing tension and pain held in muscles. A calming 60 minute massage using lavender oil. 10 minutes of rest will conclude the session with hot jade stones placed on the body allowing warmth and relaxation. Aromatherapy is a healing art, which uses essential oil extracts of flowers, nuts, leaves, seeds, and bark to promote healing. These oils are the life force of the plants from which they have been extracted. 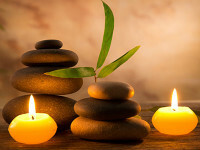 In a natural way, aromatherapy assists the body to reach a state of balance to encourage healing. Aromatherapy and massage work hand in hand when essential oils are inhaled by the client and during massage the oils are absorbed through the skin. This combination can provide stress and pain relief, aid sleep disorders, help fight skin condition and muscle dysfunction, ease symptoms of digestive pain and premenstrual syndrome, and energize the mind and body. Visa, Master Card, American Express and Discover Cards accepted.